Slider phones aren't entirely new, though the form factor has certainly picked up in popularity these past few years. A large part of this is due to the increasing prevalence of cell phones made in South Korea, most notably from LG Electronics and Samsung Electronics. There are several advantages and disadvantages to these unique phones. While flip phones (or "clamshells" as they are sometimes called) are still the most popular style of mobile handset -- perhaps best demonstrated by the super slender Motorola RAZR -- slider phones are steadily on the rise in the marketplace. The biggest selling point of a slider phone is that it is still relatively rare in the marketplace to find such a form factor. Most people are still using flip phones and candybars, so if you come to a party and chat it up on a slider cell phone, you will more likely stick out from the crowd. Many people enjoy having a handset that is different than other people, and just shape alone can sometimes be enough to accomplish that. Fashionable: Cell phones are just as much a fashion accessory these days as they are functional pieces of technology. If you're rocking a glossy black phone that slides open to answer calls, you've clearly got it going on. Large color screen: Typically, the display on these mobile phones is a little larger than a similar phone in clamshell or candybar form. Moreover, this large color screen is always available for viewing, unlike the main displays of flip phones. Relatively compact: Because the keypad is hidden away when not in use, it is possible to make these phones much more compact, having a much smaller footprint. Accessible: Though the numerical keypad is hidden away when not in use, the main buttons -- call, end, directional pad, etc. -- are still readily accessible even when the handset is in its "closed" position. You can choose whether to turn the "key guard" on or off. Ease of use: Just as you can flip open a clamshell with your thumb, you can slide open one of these phones with one hand as well. This makes it particularly easy to answer and/or end a call when you have your hands full. Naturally, as there are upsides to slider phones, there are downsides as well. 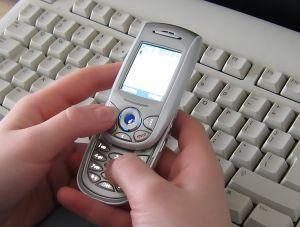 No screen protection: Part of the appeal of flip phones is that the main display is hidden away when the phone is not in use, preventing it from getting scratched and so forth. This is not true with slider phones. Wobbling: A common problem with many slider phones is that the rail on which the phone opens and closes is not the strongest mechanism in the world. As a result, the top half may "wobble" when the handset is in the "open" position. Although it won't fall off on its own, this can be a bit of an issue for some people. Could be thicker: If you must have the thinnest of the thin, then you have little choice but to opt for the skinny candybars on the market. Typically, slider phones and flip phones are thicker than their candybar counterparts, though there exceptions, like the 12.9mm-thick Samsung D900. Some of the most popular slider phones on the market, either readily available through wireless service providers or through cell phone importers, are described below. Everyone loves Chocolate. Verizon Wireless has the LG Chocolate Phone, easily one of the most attractive mobile phones on the market today with its wonderful touch-sensitive keys and deliciously-tempting keypad. The glossy black exterior is to die for. Telus Mobility of Canada also has this phone. The GSM version -- KG800 -- looks slightly different, opting for a rectangular navigation panel instead of the music-centric wheel. The KG800 is currently available in Europe, and may be reworked as the TG800 for Rogers Wireless soon, complete with the all-important 850MHz band. Samsung is known for producing a wide range of slider phones. On the lower end of things, you'll find handsets with VGA cameras and no music playback capabilities. On the higher end, you'll find high-speed 3G data, multi-megapixel cameras, and advanced multimedia functionality. One example is the Samsung D600 with its 2 megapixel camera, TV-out, quad-band connectivity, MP3 ringtones, Bluetooth, and microSD expansion. Nokia, the world's largest cell phone maker, typically does not produce sliding handsets. One of their best offerings, however, happens to sport the popular form factor: the N80 smartphone is powered by Symbian Series 60, offering a complete suite of multimedia and PIM (personal information management) applications. You'll also enjoy a powerful 3.15MP camera, built-in WiFi, Bluetooth v1.2, stereo FM radio, and high-speed UMTS. Though not yet formally available, the Motorola RIZR is essentially a slider phone version of the ubiquitous RAZR and SLVR. Key features include a landscape display, 2 megapixel camera, music/video player, and "intuitive functionality."